Jack Knox is an attorney who, for some strange reason, is constantly asked to investigate things. First the beautiful Margery Fleming walks into his office, asking him to find her father, a disreputable politician (or just politician, as adding "disreputable" as an adjective seems repetitive). Then Margery's two maiden aunts, Lavinia and Jane, start having problems: Lavinia finds her pearls missing and Jane disappears, just as Margery's dad is found dead. Somehow Jack bumbles his way into a solution to both mysteries. 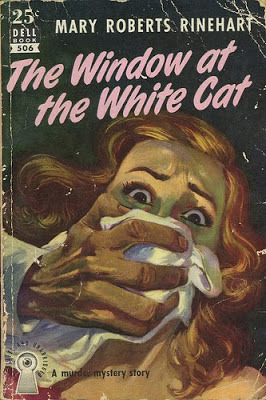 The Window at the White Cat definitely isn't one of Mary Roberts Rinehart's best mysteries, although I did enjoy it. On the surface it has a lot of elements in common with The Man In Lower Ten (review here): a bachelor lawyer who investigates crime and sneaks around dark houses at night; a beautiful woman with a problem whom he's clearly attracted to; and the atmosphere of an olde-timey movie. However, Jack (and really none of the other characters, either, excluding Aunt Lavinia) isn't as charming and interesting as Lollie, the two mysteries don't work that well together, and the book is about twice as long as it should be. Still, reading The Window at the White Cat wasn't a horrible way to spend a few days. I think my favorite parts of the book were Jack's visits to the Aunts' house, which reminded me of the movie Arsenic and Old Lace (but without the trips to Panama). Crazy old ladies FTW! I also kind of liked the peek into 1910's politics, if only because it's pretty clear the general opinion of politicians has not changed that much in the last century. While The Window at the White Cat isn't a novel I would unreservedly recommend (unlike The Man In Lower Ten), it's okay. I do have to say that I love Rinehart's titles though: they sound very odd and nonsensical until you read the book, and then they're PERFECT. Here the White Cat is a political club. You'll have to read the rest of the book to find out how the window fits in! Chris' review of The Window at the White Cat here. Melody's review at Redeeming Qualities. My review of The Man In Lower Ten here. My review of The After House by Mary Roberts Rinehart here. Aarti's review of Bab: A Sub-Deb by Mary Roberts Rinehart here.